Winter is coming. Those famous words is the motto of House of Stark couldn’t be truer in the city I call home. Technically winter is here and it has hit my skin like a doozy. With the constant flux in temperatures ranging from -20 to 5, everything skin related is important to me. I am always spending a great deal of time trying to achieve that flawless dewy complexion. The biggest way to give your skin that radiance that comes from within is hydration…and a few quality products that can help you get that glow. Up until last week, I used to cleanse my face once or twice a day. Once in the morning and once right after I remove my makeup with a makeup remover. After my recent visit with celebrity esthetician Taisiya, (she has worked on many celebrities including Maggie Q), she advised me that I need to cleanse my face twice when it comes to removing my makeup. After I apply the makeup remover to take off all the makeup from my face, I should use a cleanser with a bit more grit to help me remove any residual trace of makeup and pollution that’s still lingering on the surface. After I have rinsed off this initial cleanser, I should cleanse one more time with something more gentle because this time I will be actually cleansing my face. For cleansers that have a bit more grit to help me slough off residual makeup and pollution, I rely on a combination of exfoliators or cleansers with tiny microbeads. 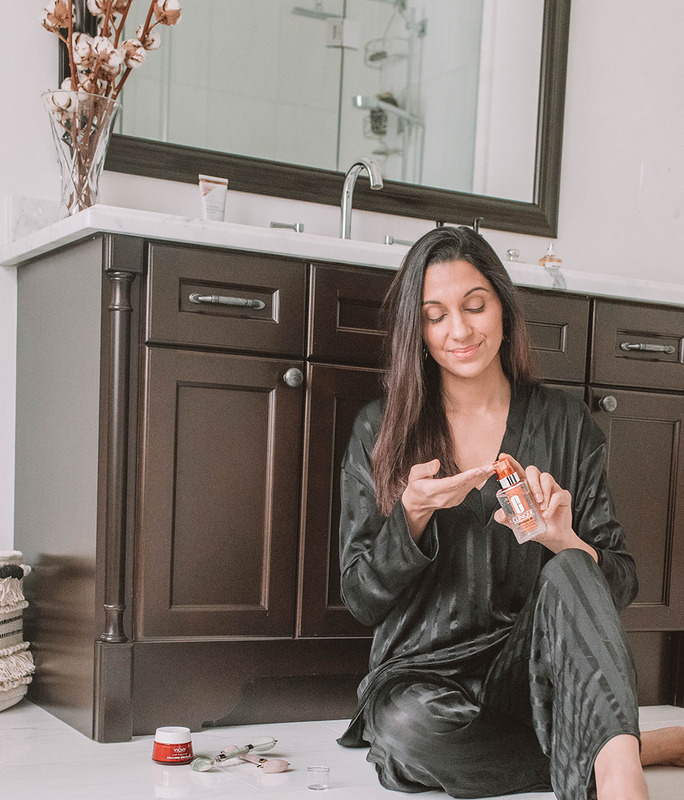 I personally love the TRUTH SMOOTHIE COMBO, which consists of The Clean Truth Foaming Cleanser and Transforming Walnut Scrub, from Ole Henriksen because it does a great job without drying out my skin. Another favorite that has zero grit and is incredibly gentle is The Cleansing Gel by La Mer. The last one that I basically survived on in the holidays is Nannette de Gaspe’s, Essense Noir Polish (or what I call the caviar of exfoliates). For days when I am wearing heavy makeup (like weddings or a photo shoot), I rely on cleansing oils. Cleansings oils is a must for me to helps breakdown the makeup that’s still lurking around my eyes, nose and cheeks. 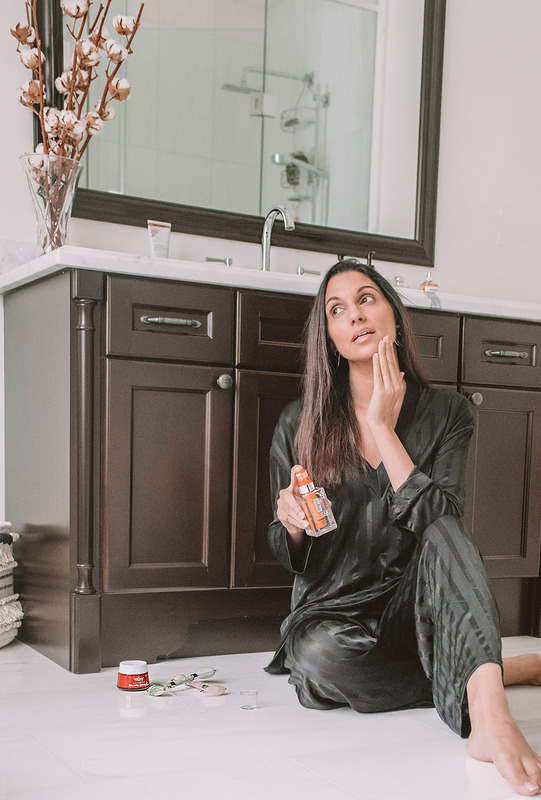 My favorite cleansing oil that works wonders on my skin is the Squalane + Antioxidant Cleansing Oil by Biossance.This baby is rich in anti-oxidants, light and leaves my skin feeling soft and hydrated. As for a gentle cleanser, the two I highly recommend is Neutrogena Hydro Boost Hydrating Cleansing Gel and Shiseido’s White Lucent Brightening Cleansing Foam. Both have done wonders to my skin and I alternate between the two depending on how my skin is feeling. One shocking thing I learned in my late twenties is that once you hit your mid-twenties, your natural collagen production declines anywhere from 1-1.5%. Once you hit your 30’s, the loss of collagen is noticeable so you rely on products to help you mask it. Around this time, I came across Vichy’s Liftactiv Collagen Specialist. This amazing product has been brilliant in helping me increase the elasticity of my skin, make it feel firmer and hydrated. The first time I used this product, I was instantly obsessed. 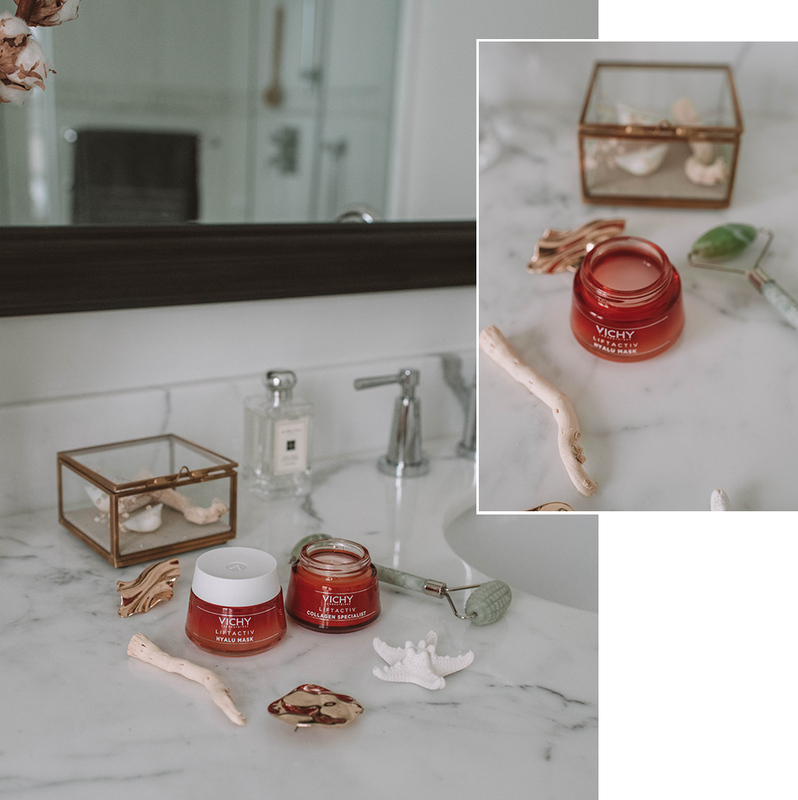 I have tried a few products that can help me correct the signs of collagen loss, but this was one I could see and feel the difference directly on my face. When I first heard about facial rollers, my first thought ‘what is it and do I really need it?’. Every week there is always something new launched in the beauty industry and I’m constantly asking myself, do I need this new tool? Is it worth the investment? And the most important question – can I do without it and achieve the same results? There are so many facial rollers out there, but here are three that I have been using depending on my skin. Best part, all three are under $50 each! 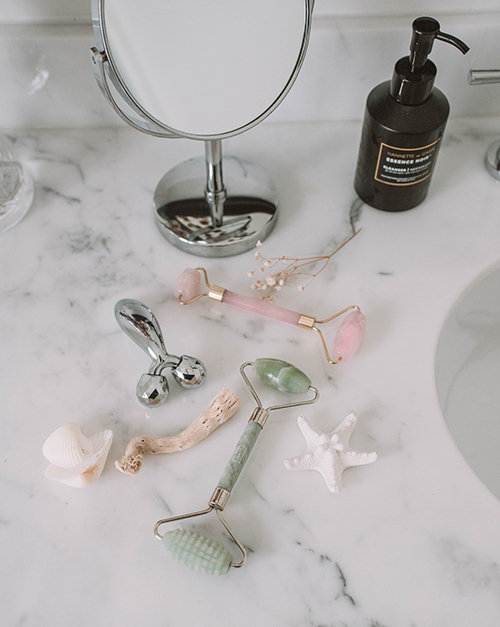 This means, if you want to get a facial roller – budget is not going to be an issue. But let’s break down when you use each type of facial roller. PINK QUARTZ: This is my go-to roller when it comes to prepping my skin. After I have cleansed my face and applied my serum, I will roll the cool pink quartz roller all over my cheekbones, nose, forehead, and neck. This will help stimulate circulation and help depuff your skin. JADE ROLLER: If you sleep on your side, there is a high chance the other side of your face is going to be tight. My jade roller helps me remove the tension on that side by rolling in upward and outward motions on my cheeks, near my orbital socket, forehead, and chin. The jade roller is also great to help promote drainage from the face. I also sometimes use it over my sheet masks to help my skin effectively absorb all the nutrients. SILVER ROLLER: This is one roller I have to hide from anyone that visits my house because let’s face it – it looks funny as heck. I got this roller because I fell in love with the design (yes I said, it is the design that drew me in). Why? I could see it was exactly what I needed to help lift, sculpt and contour the areas around my jawline, cheekbones, orbital region/brow bone, and nose. If the budget is tight for you, this is one roller I highly recommend you get – especially if your eyes are as big as mine. With the harsh winters we have, one thing I can never have enough of is moisturizers (and oils). 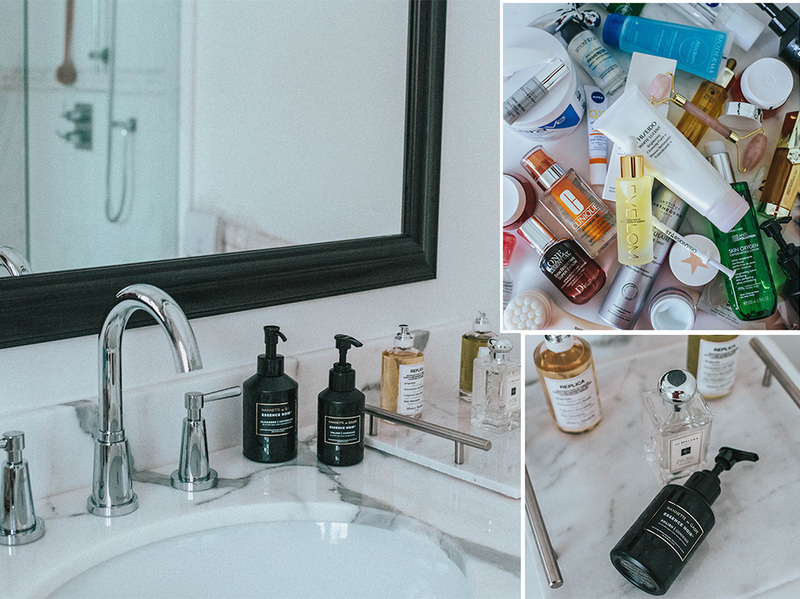 I moisturize religiously, but recently I had my skin analyzed at a Shoppers Drug Mart event to help me figure out if #MyRoutine for taking care of my skin was good or needed some modifications. Let’s just say my skin analysis was not good (my skin is only 37% hydrated). It’s basically a parched desert and dying for hydration. Thankfully their beauty expert set me up with Clinique ID that’s just right for me. Taking a few steps back, the Clinique ID line is brilliant. They created a system where you can customize your hydration. There is one that targets uneven skin tone, another tackles fine lines and wrinkles, and my favorite minimize your pores and evens out the texture of your skin. Because my skin always looks tired and fatigued, I got one that helps my skin look refreshed and energized, thus helping me achieve that glow. If you ever want to get your skin accessed for free – arrange a meeting with a Shoppers Drug Mart Beauty Expert! They will use a series of tools (all painless) to help you identify your skin health and how to address any issues your skin might have.